Easter weekend’s cold weather may have you feeling like spring is never coming. Despite the temperature, we know it has begun; our friends Blake, Desmond, Mark and Winston have arrived from Jamaica! This marks ten years that we have been participating in the FARMS program with Jamaica. For us, the arrival of these men heralds the arrival of spring on our farm. Two of the men who arrived this week have been with us since the first year. Over the coming weeks more of them will arrive, making an event to look forward to each week. The friendship we have with them enriches our lives and brings joy to our work. 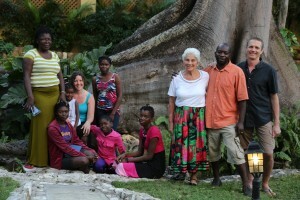 For them, the income they make here enables them to build a better future for Jamaica. 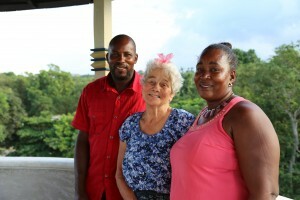 Blake and his wife have built a home and small Jerk Shop on land they were able to purchase thanks to his job here. Desmond’s daughters are studying hard at good schools. Tuition is not paid for by the government. It’s a real pleasure for us to visit them in the winter, not only for the beauty of the island and warm weather, but to see them growing and learning. Our family spans the ocean.